I could have easily posted this image and left it at that. After all, the photograph undoubtedly triggers romantic notions, even for the non-traveler…but then you wouldn't have seen the train coming out the other side. Yep, that's right, the tracks run along the beach then through the cliff. I believe, whether it's from experience, a book, or a movie, nearly every one has fantasized about Ireland; imagined standing on the edge of such a cliff surveying the ocean, or wandering through the sea of green fields as often pictured. Nothing short of breathtaking can describe the scenery. Throw in a train ride, and a ruin or two, and it has all the elements of a fantastic story. What could be better? My daughter says, at the ripe old age of fifteen, it's disappointing that in her lifetime there aren't enough years for her to read all the good books (gotta love her). My reply, books are wonderful, fanciful, comforting, and inspiring, but you have to write your own incredible story! Create a life equally as impressive as anything you've ever read, so close the book, turn off the movie, and let's hop another train. Our journey begins along the Heritage Trial in the vibrant walled 16th century city of Derry, officially Londonderry, the fourth largest city in Ireland and the only completely walled city. Life here resonates centuries of culture mingled with modern vices and amenities. It certainly is a worthy launch point for another adventure. First order of business, a walk along the ancient city wall, followed by a pint at Peadar O'Donnells, before boarding for our short, spectacular journey. 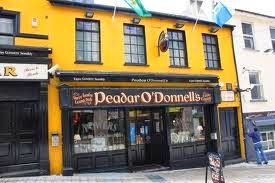 At Peadar O'Donnells they play traditional Irish music every day, all day. 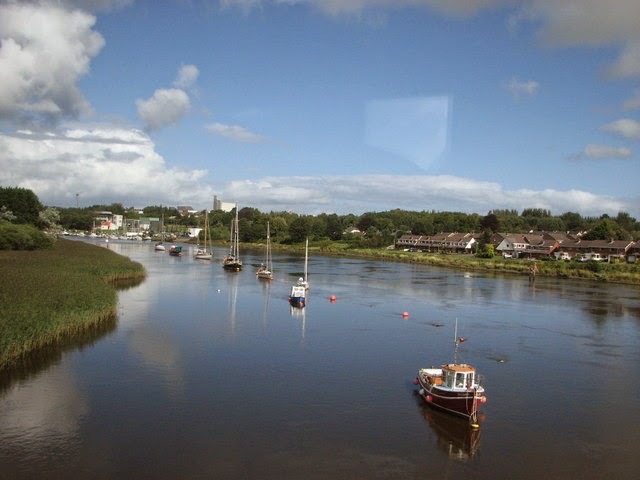 Upon departure, our train will follow the River Foyle and head into the lush green countryside. Before long we'll arrive at Benone Strand where magnificent mountains and cliffs meet golden sands - miles of clean, firm, golden sands and no rocks. Perfect for a walk or a picnic, a great place to linger for a few hours or stay for a week. If the notion of staying on the beach suits you, this is the place. 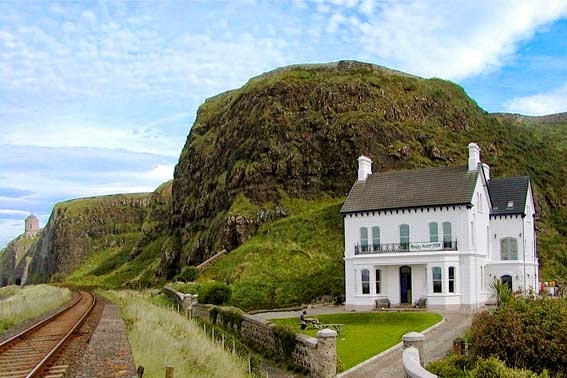 Stay at the Downhill Beachhouse & Hostel. Unlike any hostel I've ever stayed in, Downhill looks utterly charming (more like a B&B). It's perfectly situated overlooking the longest beach in Northern Ireland with direct beach access. 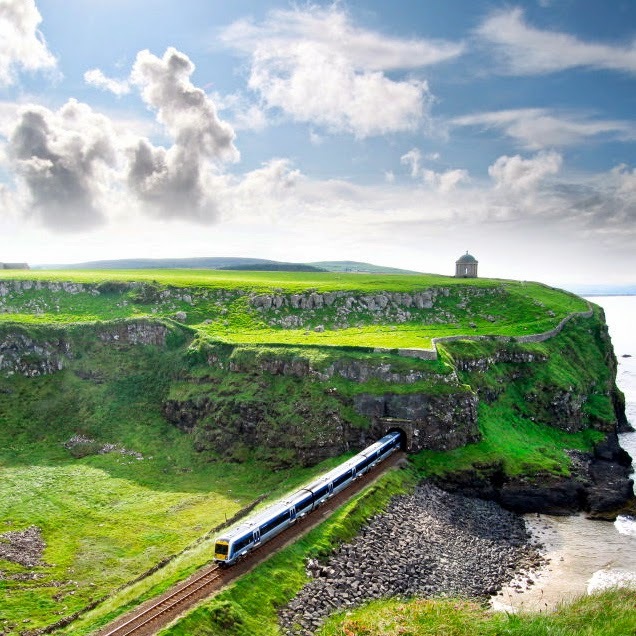 It neighbors the Downhill Demense National Trust with the famous Mussenden Temple monument and the ruins of Downhill House which sit above on the cliff our train passes through. 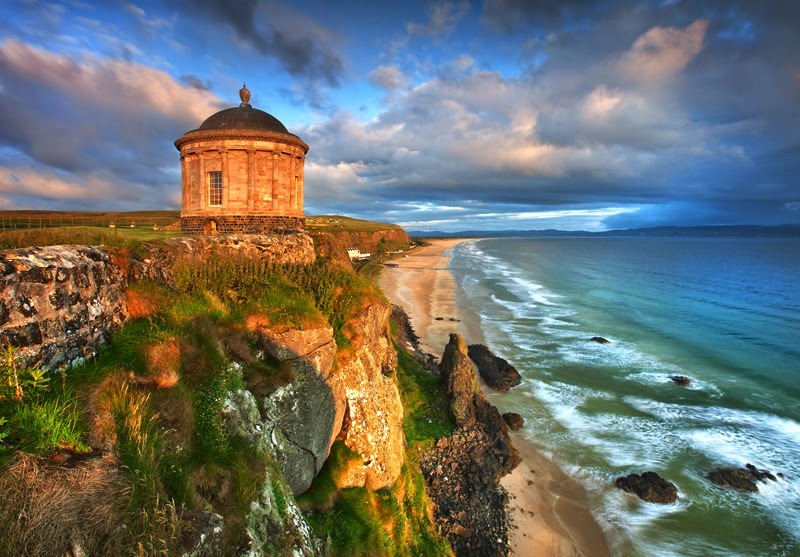 Mussenden Temple monument was built as a library in 1785. Now there's a good place to read a book, that is if you can keep your eyes on the pages. We'll pass by and through the maritime cliffs of Downhill where the raged coast appears like the ripped edge of a velvety green fabric swirling 120 feet above the blue sea - a seemingly endless romantic landscape. 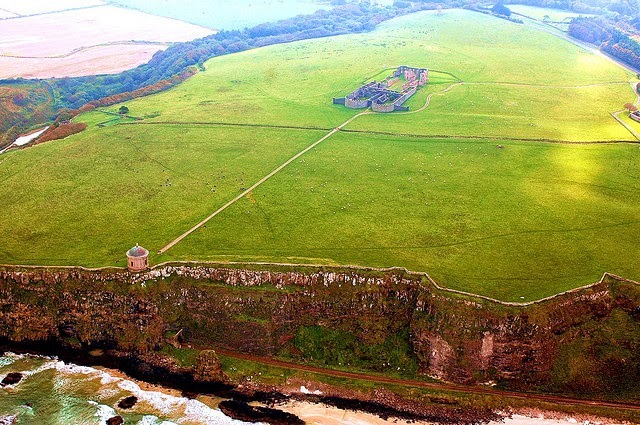 The station of Castlerock, dating from 1875, is the stop for exploring this paradise. From here you can shop, dine, hike, picnic beachside, or catch a ride to Downhill Hostel. If wildlife viewing is your preference, there's an abundance in the area. Powerful and fast-flying Perigrin Falcons, among other birds, call this area home. On the last segment of our short journey, the rails turn inland for 4 miles as our train runs through the scenic valley of the River Bann, on it's way into Coleraine. Our “great railway journey” has taken just 45 minutes (without stops), but the impression it leaves will last a lifetime. There are many beautiful places to visit. In this blog we will read about an Irlandwhich is so beautiful and I would go there after completing my laustan review projects. I like the blog so much.